Schrock Innovations has produced and released a new commercial featuring the 2010 Holiday Special on ESPN 1480 in Lincoln, NE. The new ad will begin airing on November 8, 2010 and will run through November 28th, 2010. Click here to download or play the commercial. Schrock does not do a lot of advertising on Lincoln’s only full-time sports talk station, so the ad has been scheduled in heavy rotation to achieve maximum awareness before November 28. What is the 2010 Holiday Special? 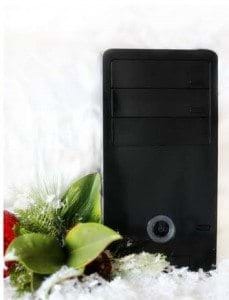 The 2010 Holiday Special computer is a special system offered once a year in very limited quantities. This year’s Holiday Special features a 120 GB solid state hard drive, a 6-core processor and 12 GB of RAM. For $1,499 purchasers receive the tower, a full 1080p HD display, wireless keyboard and mouse, and speakers. If the purchase is made before November 28, 2010 customers receive a $100 instant rebate, bringing the cost down to an amazing $1399. The 2010 Holiday Special computer is only available at Schrock Innovations, and can not be custom built at any price on the Dell or HP websites. Whoaw! That is neat. 🙂 I’m loving the holiday special.. Looking forward to your commercial. That’s great to hear.. Thor. Sounds like a good draw. I remember seeing you years ago on that Joel Comm show on the Internet. Are you still doing Internet marketing? Great sounding computer in your holiday special. 12gb of ram is impressive. I really need to upgrade to a computer like that.